Here at Waikato Stud, we are fortunate to work with some of the world’s best bloodstock. The foaling season is well underway, and each day over the next few months we will welcome the arrival of the next generation of little champions. In the famous foals segment, we will meet foals from some of Australasia’s toughest race mares as well as siblings of elite racehorses. In the first edition of famous foals, we introduce to you a Savabeel colt from the Group One producing Encosta de Lago mare Halloween. 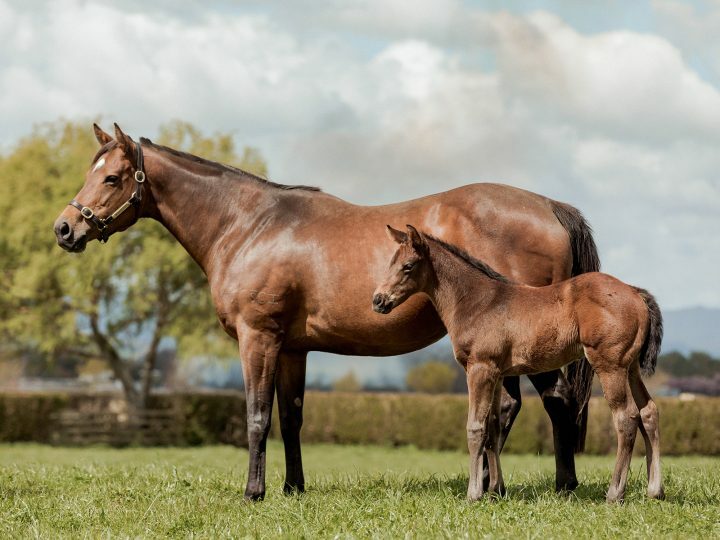 The dam of last year’s Gr.1 NZ 1000 Guineas winner Hasahalo (by Savabeel), Halloween is out of the Listed winning Danehill mare La Lagune who enjoyed a great career at stud, producing Stakes-placed gelding Just Forget it, as well as successful broodmares Halloween and Generous Nature (the dam of multiple Group winning sons of Savabeel in Savvy Nature and Addictive Nature, as well as Stakes, placed Sir Ferrari (by Testa Rossa). Halloween is currently co-owned by Waikato Stud and Anthony Mithen and was a cheap May Sale purchase at Karaka at the insistence of Group One-winning Australian trainer John O’Shea. “We bought her for $6,000, at John’s insistence, and she had a foot like a cow, to be honest,” Chittick said. Hasahalo was subsequently bred by Waikato Stud along with John and his wife Isabel and sold at Karaka in 2016 for $110,000 to Albert Bosma’s Go Racing NZ syndication company. Go Racing loved Hasahalo so much as a two-year-old they returned the following year to purchase her full brother, Hasabro for $220,000 from Waikato Stud’s Karaka Premier Yearling draft. A horse who is blessed with plenty of the family’s ability, Hasabro has made the trip to Australia this prep for a campaign aimed at the Gr.1 VRC Derby. Halloween has produced another beautiful foal this year, a full brother to Hasahalo and Hasabro by Savabeel.